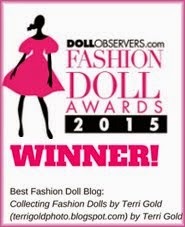 News, reviews and photographs of Modern Fashion Dolls including Kingdom Doll, Fashion Royalty, Sybarite, Tonner Doll, Gene Marshall, Barbie and my own experiences as a doll collector. Here are two new photos of this beautiful doll. She is wearing a wig made by Chewin. Her red velvet gown is Sybarite Fidele's. The faux fur stole is by Integrity Toys. The necklaces are by Kingdom Doll and the earrings may be Franklin Mint. The background is a Tonner Evangeline or Ellowyne mirror. I really like the black and white version because it shows the highlights and they seem to glow. I love being able to see the back of her wig as well. Sales: Kingdom Doll, Ficon, Other 16"
Sales: Integrity Toys 12" - 16"
All Material photographed and written on this site (unless otherwise noted) is Copyright © by Terri Gold - 2019. You may not copy, use or otherwise disseminate, publish, offer for free or sell any of the material that appears on this site without the written express permission of the copyright © owner. You may, however, link back to this site. Your E-Mail Address Always Kept Private...even from me! Brodjam has put together an excellent illustrated chart for Tonner and Wilde Imagination dolls - male and female. Award winning, retired New York City public school art teacher, teacher trainer and photographer now spends wonderful days playing with dolls. When I switched photo servers a few years ago, many of my images were lost in a black hole. If you are going back in time throughout my blog, you will come across these black holes. It's unfortunate but it would take me a huge amount of time to identify and republish the images. If there is a specific one you are very interested in, email me with the date of the post and I will try to get it for you. Thanks for your continued interest in my blog!